Winter athletes have great joy when riding Austria's largest aerial tramway to the Ahorn Plateau, the joy is great for winter sports. In order to enjoy fun on the slopes even more, it pays off to give a visit to INTERSPORT Bründl base station Ahornbahn: The ski rental not only has a wide range of skis for sale or rent, attention is also paid to the proper footwear. The expert INTERSPORT Rent coaches know: Professional ski boot fitting is the basis for unspoiled winter adventures! Winter sports enthusiastic customers of INTERSPORT benefit from the know-how that is happily provided by the INTERSPORT Rent experts. 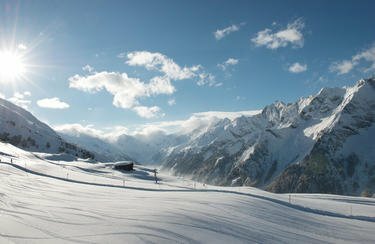 The ski rental INTERSPORT Bründl, base station Ahornbahn keeps up with times by convenient online-services: Book your equipment already before you arrive and receive it, perfectly maintained and updated, at the base station. That way there is still enough time to have a look at the boot line or have your ski boots customized to the needs of your feet before hitting the slopes. Trustmark Austria's trustmark stands for safe and trustworthy online shopping and mobile shopping. INTERSPORT Rent is recertified here every year. Get FREE information for your holiday in Mayrhofen to your mobile! Sehr nettes Team! Auch auf der Bergstation! Viele Grüße und bis nächstes Jahr!